UCSD’s sixth annual Hullabaloo took place on Friday, Nov. 18 in Matthews Quad and Town Square as part of the celebration for Founders Day. The event was first organized in 2011 by Associated Students Concerts and Events to add a student component to Founders Day. After the Founders Day celebration from noon to 2 p.m. on Friday, Hullabaloo transformed “the center of campus into an explosion of lights, colors and music” when it opened its doors at 8 p.m. This year’s festival had music, amusement rides and food provided by HDH, Taco Villa, Goody’s and Yogurt World. 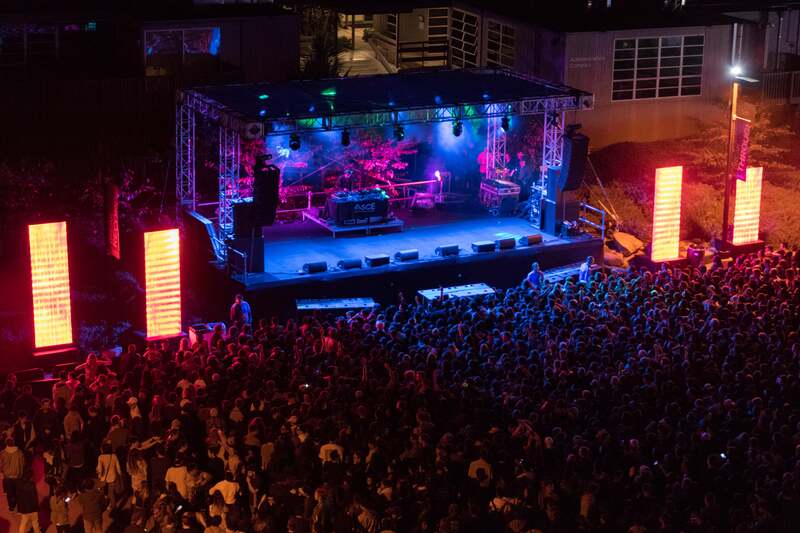 For the concert part of the event, ASCE assembled a lineup of headliner Isaiah Rashad, flanked by Andrew Luce and Tennyson, who all performed on a stage set up in Town Center. Marshall College sophomore Amber Fossier told the UCSD Guardian that while she had never listened to any of the artists’ music before, she liked Luce’s act. “I didn’t know any of the artists prior to attending Hullabaloo, but I enjoyed Andrew Luce’s set,” Fossier said. Earl Warren College sophomore Henry Guerra was impressed by the response to Rashad’s headlining. Warren senior Nicole Farrales noted that she preferred the 2016 lineup to last year’s. Farrales, who also worked for One Stop and is familiar with members of Associated Students, added that she felt ASCE did well with keeping the student body in mind when finding performers. The event offered a variety of ride choices to all attendees, including the Zipper, the Round Up and the Hurricane all set up across Matthews Quad. Fossier explained that there was one line for all three rides, causing long wait times. Given that the food provided was not unique to the event, Fossier opted out of buying anything from the vendors as well. “I didn’t have any of the food and didn’t go on the rides mainly because the food was just the food trucks that are on campus normally, and I didn’t feel like that was special or anything,” Fossier stated. Hullabaloo went late into the night, with Rashad taking the stage around 11 p.m. and the rides closing at 11:45 p.m.